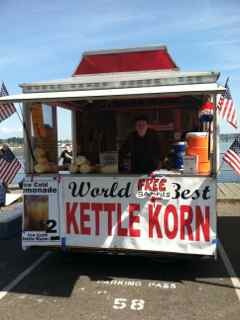 World's Best Kettle Korn was started in 1997 by Kenn and Judy Weakley after retiring from Newspaper Advertising. 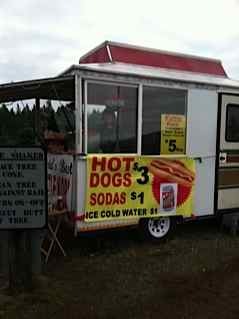 We have a professionally built concession trailer and sell every week at the Port Orchard Farmers Market in Port Orchard Washington. We have two set ups and can work any where in Western Washington. We have done Fairs, Rodeos, Car Shows, Festivals, Flea Markets, Gun Shows. Tractor Pulls, U S Navy Picnics, Concerts, Octoberfests, The Black Berry Festival, 4th of July Fireworks, Pumpkin Patches, Christmas festivals and Tree Farms. We have perfected the Kettle Korn over the 15 years of Popping and learned some flavor tricks that make it the World's Best and our customers tell us it is. 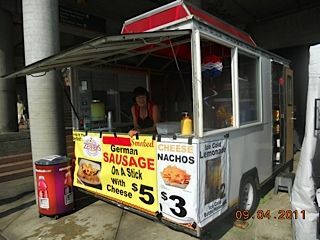 We also do German Sausages with Sour Kraut, Hot Dogs, Chili Dogs, Nachos, Walking Tacos and fresh Lemonade in a second set up to do venues that have a Kettle Korn vendor. We would like to do your event anywhere in Western Washington any week. Please call us at our home phone at 360 898 1373 or our cells at 203 216 5130 and 360 229 0616, and our emails at kenn294@aol.com or Jud619@gmail.com. We are available as two separate vendors at any event.